Live 1972 performance on 4LP set! On 180-gram vinyl for the first time! 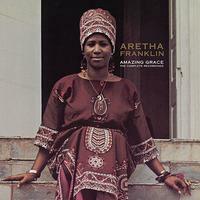 On LP for the first time, Amazing Grace is the biggest selling release of Aretha Franklin's 50+ year career and the bestselling gospel album of all time. The Gospel masterpiece album took Franklin back to her roots in the church. This collection contains gospel tunes performed by Aretha Franklin at Los Angeles' New Temple Baptist Missionary Church on January 13 & 14, 1972.